Doing daily spiritual reading (as it is generally called) is an important part of a Catholic's spiritual life: it is a truism among spiritual directors that our souls don't stand still, so we are either advancing in holiness or becoming more worldly. The Church, priests, saints, and spiritual directors have long recommended daily spiritual reading for lay Catholics as well as religious. Our current basket of spiritual reading choices: my intention is to refresh the children's books once every week or so. What is spiritual reading? I came across a short, useful article describing it by Fr. John Barfunek. "Spiritual reading consists of reading something that explains some aspect of Catholic truth in an attractive, enriching way. Its function is to help reinforce and deepen our Christian view of ourselves and the world around us. In previous eras, popular culture itself was imbued with the Christian world view, so even popular books and dramas would reinforce the Christian value system. But now that is not the case. Instead, our minds are flooded every day by messages (advertisements, films, TV shows, news, music) that directly contradict the Christian world view. That will have its effect on how we think and what we value. In fact, this is one of the reasons the Church is suffering so much from so-called cafeteria Catholics. They get their Catholic formation from secular sources (The New York Times, Newsweek…), and so they simply can’t understand why the Church would ever be against such popular and seemingly reasonable propositions like artificial contraception, artificial reproduction, and gay marriage. Because of this ongoing flood of secular ideals, we have to consciously nourish our minds with authentic Christian teaching in order to avoid being poisoned. That’s what spiritual reading can do." 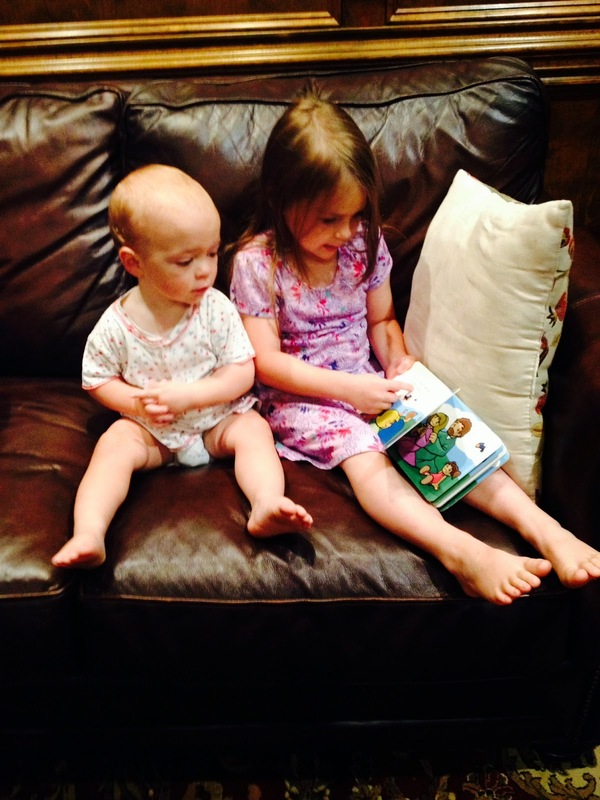 Mary and John so far prefer to read from antique missals, about 100 years old, designed for adults, not children. And they're really reading them! Mary seems to enjoy the litanies of prayer the most. How does one do spiritual reading? 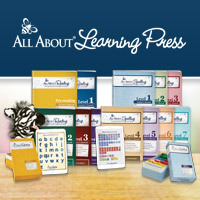 "Spiritual reading differs from plain reading not only in the content, but also in the method. You don’t need to spend a lot of time doing spiritual reading; fifteen minutes a day is fine. And you don’t need to read fast. The idea is simply to taste, chew on, and swallow some healthy Catholic concepts every day. The difference between spiritual reading and meditation is the end result. The goal of your meditation is to converse with the Lord about what matters to him and what matters to you. The reflection and consideration that forms part of your meditation is meant to spur that conversation in your heart. The goal of spiritual reading is to inform your mind; it doesn’t finish with a prayerful conversation (though that can sometimes pop up spontaneously, which is fine!)." John, looking at a picture book because he didn't feel like reading that day. can even be a form of Ignatian meditation which puts us in the scene of Jesus' life. What if I don't think I have time to read? 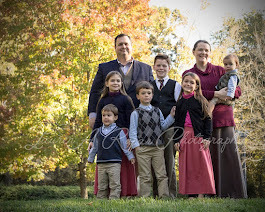 My blog readers are generally very busy mothers (most of them homeschooling), so I know from experience that it is a major challenge to make the time and space for spiritual reading. "But if you’re not a reader, or if you think you don’t have time, you can also get creative. Good Catholic novels (novels imbued with a Catholic world view, where characters exemplify Christian virtue in a realistic but inspiring way) can serve as a kind of spiritual reading. Listening while you drive or exercise to recordings of spiritual talks, homilies, or conferences (or books on tape, or even good Catholic podcasts) can also do the trick." 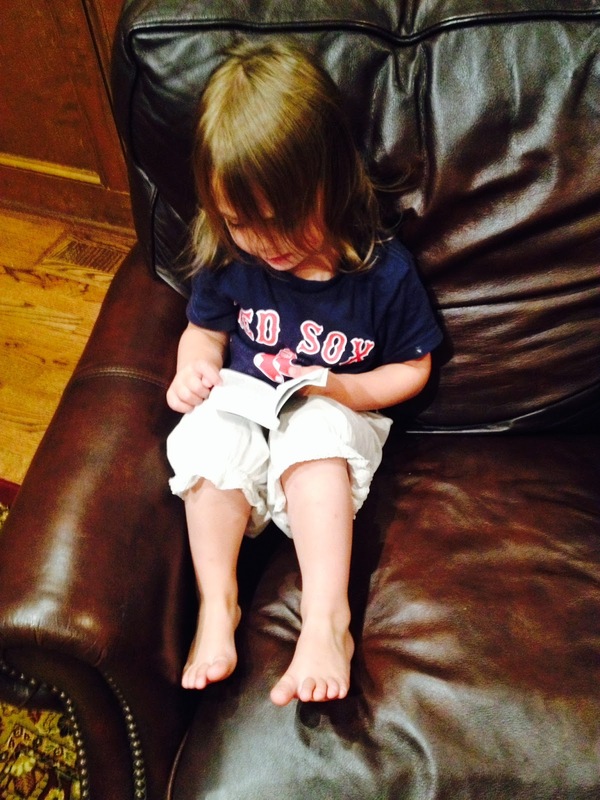 so she pretends to read from an adult's missal. In our home, I've been trying to do daily spiritual reading--in the morning when I wake up--for about three years now, since my pastor recommended it for my spiritual development. He told me that he uses "Divine Intimacy" for his spiritual reading and, having heard it recommended myself from many traditional Catholics, that is what I chose for myself as well. This book of three-page daily meditations which follows the traditional calendar has been a rich source of meditation and graces for me. My practice of daily reading has waxed and waned through various seasons, but I keep "getting back on that old horse!" I rarely get to read in solitary silence with my cup of coffee. Usually there are kids running around, someone begging for breakfast, the baby nursing in my arms, and sometimes even "Barney" playing on the television. I keep on trying. My morning spiritual reading rarely looks as peaceful as this, but I sure do feel refreshed when it does! Now, more than a month ago, my husband discovered a layman's version of the traditional Divine Office and he began using this for morning prayers (as well as afternoon and evening). While technically this is a book of prayers, which is not the same as spiritual reading, from the perspective of the children, they saw Daddy sitting down each morning with a solemn black book and talking to God. And although they had seen Mama do that nearly every morning for several years, my practice had seemingly had no effect on them. 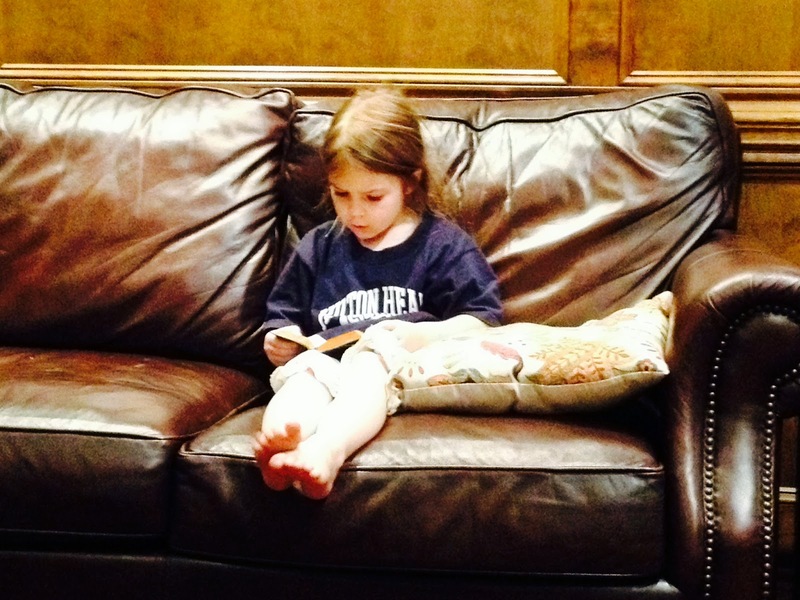 Chris and I had no anticipation of this effect, but within about a week of their watching their daddy do spiritual reading each morning--often snuggling next to him on the couch--they were begging to do their own spiritual reading! 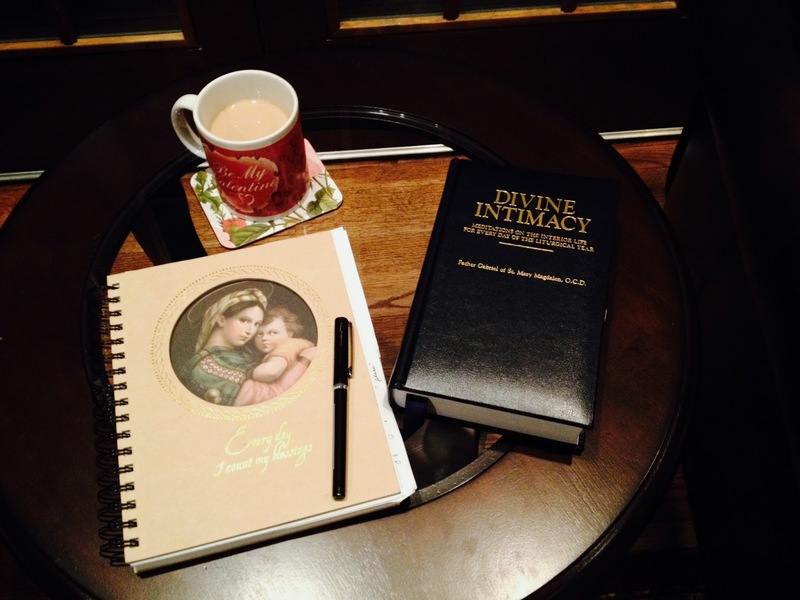 Having us do spiritual reading as a family had been on my heart for some time and I had even consulted other mothers who assign morning spiritual reading to all their children: 'just how does one do that?" Now here, I didn't even have to institute spiritual reading as yet one more of Mama's Great Ideas because the Holy Ghost orchestrated it for me! and that will keep him still--for a couple of minutes, at least! Now the kids enthusiastically remind me that after breakfast (whether we're still in PJs or are dressed already), we're going to gather in the den to do our spiritual reading. 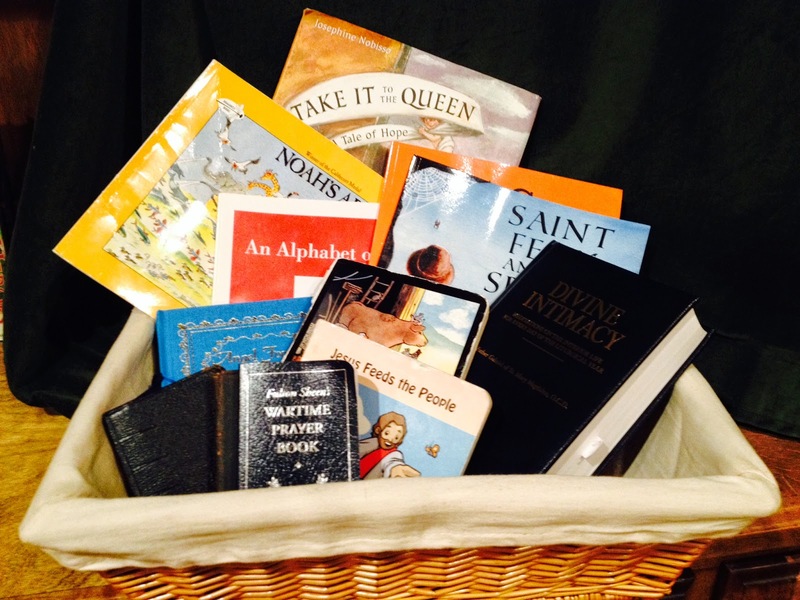 I assembled a basket of holy books for all ages: board books for Joseph, picture books for Margaret, easy readers for Mary and John, and Chris' and my chosen books. We aim for silence for ten to fifteen minutes, but what that really looks like is quiet, punctuated by a one-year-old running around the room and a three-year-old chattering about her book of choice. 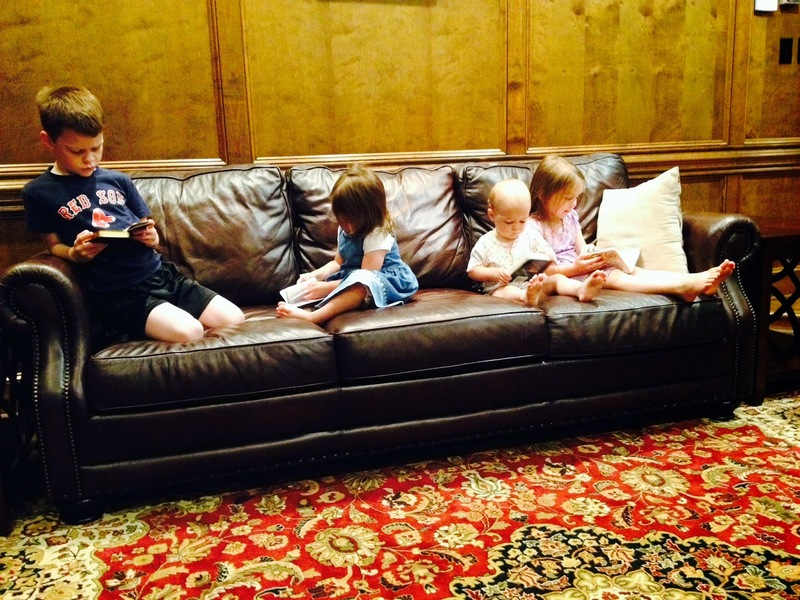 Truly, all four sitting on the couch, doing holy reading quietly: it's like a miracle. 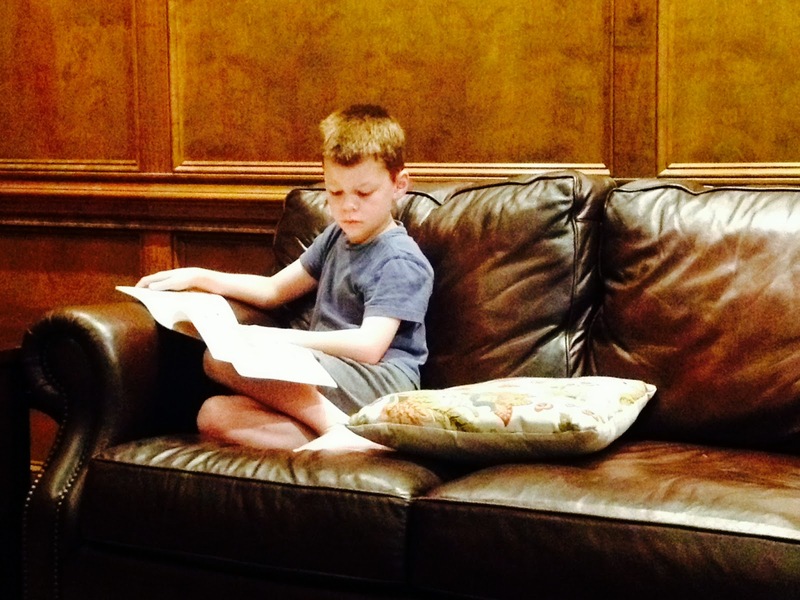 Our morning spiritual reading as a family now ranks as perhaps my favorite time of the day! Katherine, I love that notebook! Where did you find it? Kori: I bought this notebook at our local bookstore run by the Poor Clare nuns. The back of it says "Milagros" as the publisher/press. I've searched online but can't find a source of it anywhere.